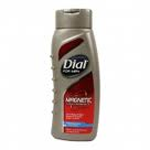 Dial for Men Magnetic is a product marketed as pheromone infused body wash with a scent that can make a man a lot more attractive to women. This product has only recently been released onto the market and it hasn’t exactly been breaking sales records. This could in part be due to the fact that some men seem to think that this product smells good, but doesn’t really help attract women. In fact, there’s doubt in the minds of many people that this product contains pheromones at all. Considering some of the customer reviews for Dial for Men Magnetic this is hardly a surprise. Does Dial Magnetic for Men Really Work? Dial for Men Magnetic looks like a product advertised to contain pheromones that in fact contains none. The customer reviews indicate that a percentage of men trying this product seem to agree with this assessment. It could be the manufacturer and seller are just trying to make a quick profit by selling a product that they know isn’t going to live up to customer expectations.